The video covered today is “How to Treat Sunburn”. For this video, I interviewed Dr. Thomas E. Rohrer, M.D., who is a dermatologic surgeon at SkinCare Physicians, and previously served as the Chief of Dermatologic Surgery at Boston University Medical Center and Boston Veterans Administration Hospital for eight years and as the Director of the Boston University Center for Cosmetic and Laser Surgery. Dr Rohrer is passionate about education and is the editor of six cosmetic and laser surgery textbooks and guest editor of numerous journals. MarcieMom: Thank you Dr Rohrer for helping us with how to shave last week. This week, we are learning about how to treat sunburn and at the same time, learn about how sunburn affects eczema skin. The way to shower and moisturize looks the same for both sunburned skin and eczema skin – not hot bath, not rubbing dry (but pat dry), trapping more moisture on the skin after shower and moisturizing right after. In a previous interview with Dr Robin Schaffran, we learnt that ultraviolet light rays penetrate through the epidermis and dermis layers of the skin and damage the DNA in skin cells, collagen and elastin in the dermis. Dr Thomas: It is a good idea to try to maximize retention of skin moisture in everyone’s skin. When the skin is burnt it becomes even more important as there is increased loss of water through the damaged skin. Similarly, with eczema or other conditions that result in dry scaling skin, the increased permeability of the skin makes it more important to keep the skin well moisturized. Keeping the skin moisturized will allow it to function more normally and recover more quickly. In the video, it seemed that hydrocortisone is applied liberally on the sunburned skin to reduce inflammation. A few questions to provide some guidelines to patients who have access to mild hydrocortisone cream and want to self-treat at home. Potency – What % of hydrocortisone should the lotion/cream be? Frequency – How frequent (in a day) can it be applied onto sunburned skin? Duration – What would be the duration and is there a decreasing frequency of application during this period? Amount – How much of hydrocortisone can be applied? What is the sunburned skin covers a large skin area? Dr Rohrer: Hydrocortisone can help reduce inflammation. On the face, no more than the over the counter 1% hydrocortisone should be used. On other parts of the body a slightly stronger 2.5% formulation may be used. It is best not to use either more than twice a day and only for a short period of time. Most of the time only a couple of days are necessary before the burn feels much better. MarcieMom: Benzocaine is mentioned not to be used. However, I read on Mayoclinic that benzocaine is used for sunburn and on Pubmed that benzocaine is effective for treating the pain (but not the itch) on sunburned skin. 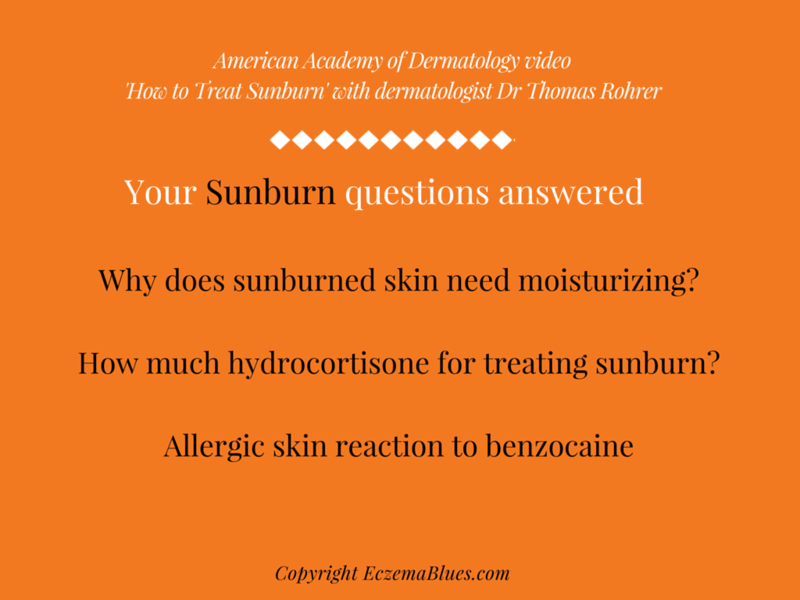 What are the reasons why benzocaine should not be used for sunburn treatment? Dr Rohrer: While benzocaine preparations do help reduce pain, many people are or become sensitive to it. We frequently see allergic skin reactions to benzocaine and therefore do not recommend it for use with the majority of patients. MarcieMom: Lastly for those with eczema, sun exposure is not recommended during eczema flare-ups. How does sun exposure affect eczema skin? Dr Rohrer: Sun exposure and sunburn are not recommended for anyone. While some people do find that mild sun exposure improves their eczema, it is not recommended as it adds to the cumulative radiation effect of the sun and can lead to skin cancers. Thank you Dr Thomas for helping us with treatment of sunburn and clarifying questions we have on self-treating at home. Sun protection is important (see AAD Video on How to Apply Sunscreen with Dr Sonia Badreshia-Bansal MD on this blog).